different cells in the body, which interpret these messages and act on them. It seems like a far-fetched idea that a small chemical can enter the bloodstream and cause an action at a distant location in the body. Yet this occurs in our bodies every day of our lives. The ability to maintain homeostasis and respond to stimuli is largely due to hormones secreted within the body. Without hormones, you could not grow, maintain a constant temperature, produce offspring, or perform the basic actions and functions that are essential for life. empties to the outside or into the lumen (empty internal space) of an organ. These include certain sweat glands, salivary and pancreatic glands, and mammary glands. They are not considered a part of the endocrine system. 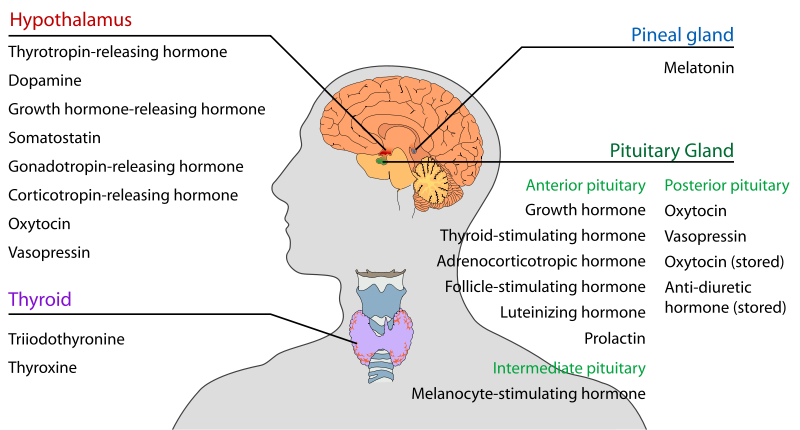 The main endocrine glands are the pituitary (anterior and posterior lobes), thyroid, parathyroid, adrenal (cortex and medulla), pancreas and gonads. The pituitary gland is attached to the hypothalamus of the lower forebrain. The thyroid gland consists of two lateral masses, connected by a cross bridge, that are attached to the trachea. They are slightly inferior to the larynx. 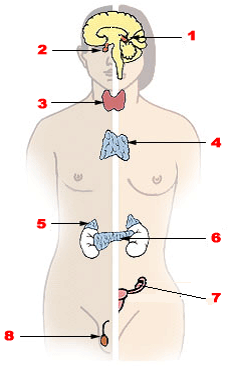 The parathyroid glands are four masses of tissue, two embedded posterior in each lateral mass of the thyroid gland. One adrenal gland is located on top of each kidney. The cortex is the outer layer of the adrenal gland. The medulla is the inner core. The pancreas is along the lower curvature of the stomach, close to where it meets the first region of the small intestine, the duodenum. The gonads (ovaries and testes) are found in the pelvic cavity. The endocrine system produces hormones that are instrumental in maintaining homeostasis and regulating reproduction and development. A hormone is a chemical messenger produced by a cell that effects specific change in the cellular activity of other cells (target cells). Unlike exocrine glands (which produce substances such as saliva, milk, stomach acid and digestive enzymes), endocrine glands do not secrete substances into ducts (tubes). Instead, endocrine glands secrete their hormones directly into the surrounding extra cellular space. The hormones then diffuse into nearby capillaries and are transported throughout the body in the blood. 1. Amino acid-derived: Hormones that are modified amino acids. more than about 100 amino acids, respectively. Some protein hormones are actually glycoproteins, containing glucose or other carbohydrate groups. 3. Steroids: Hormones that are lipids synthesized from cholesterol. Steroids are characterized by four interlocking carbohydrate rings. 4. Eicosanoids: Are lipids synthesized from the fatty acid chains of phospholipids found in plasma membrane. Hormones circulating in the blood diffuse into the interstitial fluids surrounding the cell. Cells with specific receptors for a hormone respond with an action that is appropriate for the cell. Because of the specificity of hormone and target cell, the effects produced by a single hormone may vary among different kinds of target cells. • Lipid-soluble hormones (steroid hormones and hormones of the thyroid gland) diffuse through the cell membranes of target cells. The lipid-soluble hormone then binds to a receptor protein that, in turn, activates a DNA segment that turns on specific genes. The proteins produced as result of the transcription of the genes and subsequent translation of mRNA act as enzymes that regulate specific physiological cell activity. Cyclic AMP (cAMP) is produced when the receptor protein activates another membrane bound protein called a G protein. The G protein activates adenylate cyclase, the enzyme that catalyzes the production of cAMP from ATP. Cyclic AMP then triggers an enzyme that generates specific cellular changes. the release of CA2+ from the endoplasmic reticulum, which then activates enzymes that generate cellular changes. 1. Hormones from other endocrine glands. 2. Chemical characteristics of the blood (other than hormones). Most hormone production is managed by a negative feedback system. The nervous system and certain endocrine tissues monitor various internal conditions of the body. If action is required to maintain homeostasis, hormones are released, either directly by an endocrine gland or indirectly through the action of the hypothalamus of the brain, which stimulates other endocrine glands to release hormones. The hormones activate target cells, which initiate physiological changes that adjust the body conditions. When normal conditions have been recovered, the corrective action – the production of hormones – is discontinued. Thus, in negative feedback, when the original (abnormal) condition has been repaired, or negated, corrective actions decrease or discontinue. For example, the amount of glucose in the blood controls the secretion of insulin and glucagon via negative feedback.